Castle of Pfaueninsel is located on the island of the same name, whose name literally means, Island of the peacock. This castle, situated on the Havel River near Lake Wannsee is a favorite destination for couples in Berlin. All of Pfaueninsel is talking about romance. Wannsee is a site in the southwestern part of the German capital and is the most western section of Berlin. From there the border of Potsdam and Brandenburg is very close. The beautiful island of Pfaueninsel and its fairy palace complex are part of the palaces and castles of Potsdam and Berlin, which is included in the list of World Cultural Heritage list. Pfaueninsel is a European natural reserve which is riched with special protected areas for wild birds. Along the Castle you can see different species of birds, which enhance the romance of this enchanting place that has become a favorite way for many locals at the weekend. At the end of the 17th century, Frederick William I of Brandenburg created Pfaueninsel there, therefore, at that time the place was known as Kaninchenwerder or Rabbit Island. There was built a foundry, which, however, later was burned to ashes by a fire. Over the next 100 years Pfaueninsel remained uninhabited until 1793 when the Prussian King, Friedrich Wilhelm II, a member of the Hohenzollern, decided to erect a secluded island among the river Havel. It was intended as a romantic palace for himself and his mistress, Wilhelmine Enke. Castle Pfaueninsel was built in the style of British castles. At the time of Frederick William III Pfaueninsel undergoes metamorphoses. He ordered the two architects Peter Joseph Lenné and Karl Friedrich Schinkel in 1821 to renew the fleet with new design and in the plans were the construction of several other buildings. It is was then that an area was built for the growing of exotic animals including peacocks. The house of palm trees was then also built; however, it was also totally destroyed after a fire. 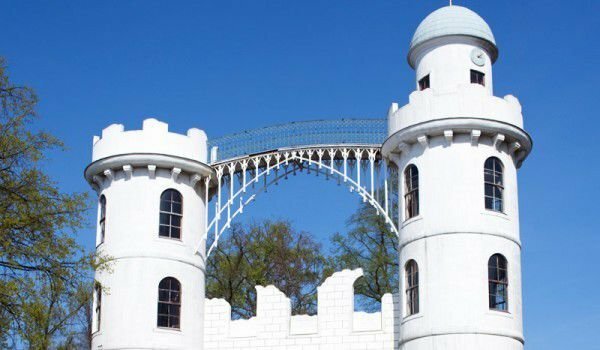 The construction of the castle itself Pfaueninsel is remarkable for its two high towers which are linked by the pedestrian bridge. Originally it was built entirely of wood, but in 1807 was replaced by iron.